Follow us on Facebook or Twitter to get for a chance to win a Kick it cell phone stand and get updates about #New Gadgets, #Gadget Reviews, Tech Start Ups, Kickstarter Favorites and more. We review products and give some helpful information before you purchase. You will receive updates with coupons for the latest gadgets and have a chance to get them first. We post contests with prizes like Kick it Cell Phone Stand, Car Phone Mounts, I phone 6 phone cases and more. We are happy to share other peoples inventions, ideas or stories on our network. Send us a message on Social media and we will re-post. From time to time we share with you some of the behind the scenes in production of our latest gadgets. Follow us and share your input to be part of the innovation and design ideas to make our gadgets even better. Message us if you would like us to review your product and share on our blog. We give a thorough review from the stand point of a consumer, inventor and manufacturer of gadgets. We will gladly include a back link to your website and share it on our networks. We believe in the power of the review and want to help the growth of new start ups. So go ahead and follow us to start a great relationship that will improve the future of our industry. Please share our pages bellow for a chance to win a Kick it cell phone stand. 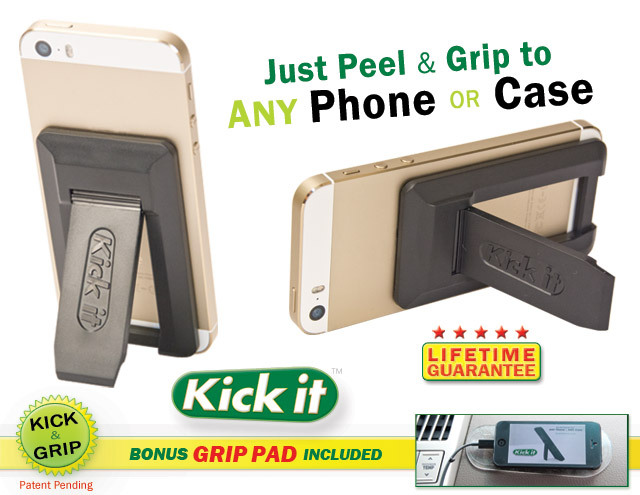 Kick it Cell Phone Stand by Gadget Ear Tech Inc.